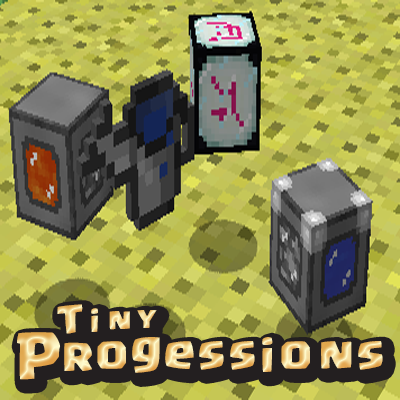 Tiny Progressions adds blocks and items to enhance your game play. The main idea is to assist the player in low-level automation and convenience plus add in mid and late game stuff as well. Vanilla style Scythes, Battleaxes, Multi Tools and Spears with extended reach. They can also be used as Swords now! They also harvest crops in a 3x3 area and replant seeds! Watering Cans: Two tiers of watering cans to help remove the need for bone meal on crops and saplings. 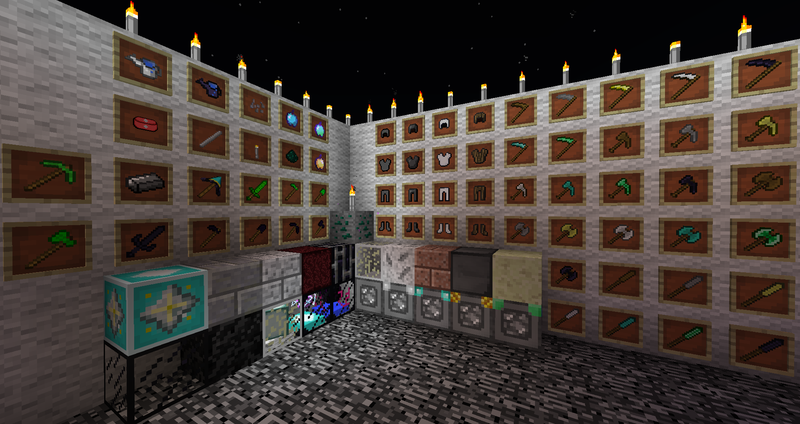 Cobblestone Generators: Five tiers of Cobble Gens for cobblestone automation. Each tier increases output speed. You can use a hopper or pipes to extract the cobblestone from the generator. Growth Crystals: These are used to increase crop growth in a 9 block radius. They do not require fuel and help in increasing your crop production. Configs: There is a lot of things that are configurable, Some things are turned off by default. i have thought about updating to 1.11.2 but as of right now I am sticking to 1.10.2 due to the modpack devs I make the mod for is staying with 1.10.2. If and when the modpack devs I work with update or move to 1.11.2 I will update the mod. i want to know that too >.< the tier 2 has a description but the normal one does not. The next update will have more info for the Growth Crystals. but as for your versions. tier 1 needs to go in the center of a 9x9 farm just above the water block. tier 2 can be used as a water source block in a 9x9 farm, or used like tier 1, or used under a 9x9 farm if placed in the center. This mod's textures are the only that do not load correctly for me in the new Sky Factory 3 modpack. Any suggestions? are you using a texture/resource pack? I'm having this problem too. I am not using a mod. Seems to work fine on a few other machines I've installed on. The generators look a bit like greyscale wrapped gifts, they're all white with bands/ribbons of greyscale colors (such as dark grey). I'm running default Sky Factory 3 with AE2 and InvTweaks installed, same as my other machines. Running Java 8.
please post screenshots and a pastebin link to your latest log. ok i did not see anything in the logs. Can you do me a favor and delete your logs folder. restart the game and play normal for about a minute or two. then zip the whole logs folder up and send it to me please. maybe i can find something in some of the other logs. Also is this SP or on a server? well idk. but from the reports i got from you and the reports i got from someone else. this is only happening on macOS and not winOS. Location: Duck Pond With Wifi, Apparently! Can I spotlight this. I love its small uses and they really help out a lot. I'd love to give it more attention and probably be as good as extra utilities, actually additions or open blocks. Any plans you are willing to reveal yet, or no, and do you accept requests. Any answers I will accept, I understand if you say no. Thanks if you reply. Sorry if this sounds strange. Its not intended too. Just like to give mods like yours more attention as that is my aim. Yes you may stoplight it. There is somethings that are in the works but i rather not talk about them. yes I accept request but that does not mean they will make it into the mod. Thank you for thinking of the mod. Your welcome, thanks for creating such as nice mod. I understand, I can wait for anything you have planned. I like this mod, its very nice for games like survival island or sky blocks. Perhaps another machine could be to make obsidian. Ex Nihilo Omnia already adds a way to produce lava via the crucible. So maybe as a addon to this your obsidian machine requires both cobble and lava and will out put obsidian in return. This way the machine isn't over powered and cheaty. Or if you don't want to make a new machine make it so the cobble generator has a low percent chance of producing a obsidian block. sounds like a fun helpful mod!. i hope to see more added. how about adding a block which given wood as fuel will output coal? like 2-5 coal per wood?